The 2013 Quaker State 400 presented by Advance Auto Parts was a NASCAR Sprint Cup Series stock car race scheduled to be held on June 29, 2013, at Kentucky Speedway in Sparta, Kentucky, United States, but was postponed to June 30 because of persistent rain. Contested over 267 laps on the 1.5-mile (2.4 km) tri-oval, it was the seventeenth race of the 2013 Sprint Cup Series championship. Matt Kenseth of Joe Gibbs Racing won the race, his fourth win of the 2013 season, while Jamie McMurray finished second. Clint Bowyer, Joey Logano, and Kyle Busch rounded out the top five. Two practice sessions were held on June 28 in preparation for the race. The first session was 60 minutes, while second session was 90 minutes long. During the first practice session, Kevin Harvick, for the Richard Childress Racing team, was quickest ahead of Jimmie Johnson in second and Brad Keselowski in third. Kurt Busch was scored fourth, and Jeff Gordon managed fifth. Kyle Busch, Brian Vickers, Juan Pablo Montoya, Paul Menard, and Ricky Stenhouse, Jr. rounded out the top ten quickest drivers in the session. In the final practice session for the race, Johnson was quickest with a time of 29.819 seconds. Carl Edwards followed in second, ahead of Kyle Busch and Gordon in third and fourth. Jeff Burton, who was twelfth quickest in second practice, managed fifth. During qualifying, Dale Earnhardt, Jr. clinched his twelfth career pole position, with a record lap time of 29.406 seconds and a speed of 183.636 miles per hour (295.533 km/h). After his qualifying run, Earnhardt, Jr. said, "We thought we had a top-five car in practice, and we got some good cloud cover about six or seven cars in front of us before we went to qualify, and that brought the track temp down to give us a good advantage," Earnhardt said. "It gave us a good opportunity to run a bit quicker lap than maybe what the car had in it." He was joined on the front row of the grid by Edwards. Johnson qualified third, Kyle Busch took fourth, and Marcos Ambrose started fifth. Denny Hamlin, Ryan Newman, Keselowski, Vickers, and Montoya completed the first ten positions on the grid. The early morning hours of race day. Defending race winner Brad Keselowski goes for a spin in the grass and then comes back up onto the track, into the wall and takes out multiple cars. Jeff Gordon, Carl Edwards, and the field are stopped on the front stretch because of a crash in turn 1. The race was scheduled to start Saturday at 8:00 p.m., but pushed to Sunday afternoon due to rain, at 12:00 p.m. E.T., This prompted NASCAR to have a competition caution on Lap 30. Carl Edwards led lap 1. 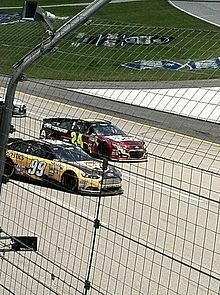 The race ran 29 laps before the first caution, which was the competition caution, The race restarted on lap 36, and four laps later, the second caution of the race came out for a tire blowout on lap 39, The race restarted on lap 48, and the third caution of the race flew on lap 49 for a multi-car wreck in the , Brad Keselowski, Greg Biffle, Kurt Busch and others were involved in the incident, it started with Brad Keselowski spinning in the grass, and took out multiple cars, The red flag was displayed with Jimmie Johnson the race leader, it was lifted after 18 minutes and 34 seconds The race restarted on lap 51. A couple laps later, The fourth caution came out on lap 89 for debris on the track. David Gilliland blew a tire and brought out the fifth caution, Kasey Kahne won the free pass, The race restarted on lap 94. The fifth caution of the race came out on lap 149, Jeff Gordon won the free pass under caution. The race restarted on lap 154, Jimmie Johnson took the lead, The fifth caution then came out on lap 241 for a tire blowout. 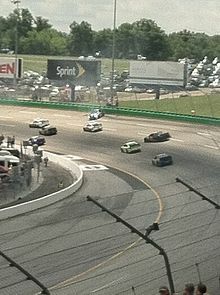 The race restarted on lap 243 and the sixth caution came out for a wreck again, on lap 246, the race restarted on lap 250, Matt Kenseth won his first race at Kentucky. 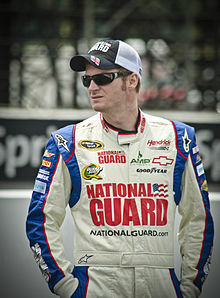 Dale Earnhardt, Jr. won his first pole position of the year, setting a new qualifying speed record of 183.636 mph. Matt Kenseth took his fourth race victory of the 2013 season. 1. ^ Points include 3 Chase for the Sprint Cup points for winning, 1 point for leading a lap, and 1 point for most laps led. 2. a b c d e f Ineligible for driver's championship points. 3. ^ Post entry, driver and owner did not score points. ^ "2013 NASCAR Sprint Cup Schedule". ESPN. Retrieved 2013-06-27. ^ "2013 Quaker State 400 weather information". The Old Farmers' Almanac. Retrieved 2013-07-01. 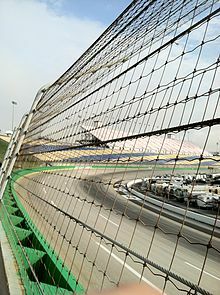 ^ "Quaker State 400 Race Information". Jayski's Silly Season Site. ESPN. Retrieved 2013-06-28. ^ a b c d "Quaker State 400 1st Practice Speeds". Motor Racing Network. Retrieved 2013-06-28. ^ a b c "Quaker State 400 Final Practice Speeds". Motor Racing Network. Retrieved 2013-06-28. ^ a b Spencer, Reid (2013-06-28). "Dale Earnhardt Jr. takes his first pole of 2013". NASCAR. Retrieved 2013-06-29. ^ a b c d e "2013 Quaker State 400 Qualifying Results". Motor Racing Network. Archived from the original on 2013-07-04. Retrieved 2013-06-28.